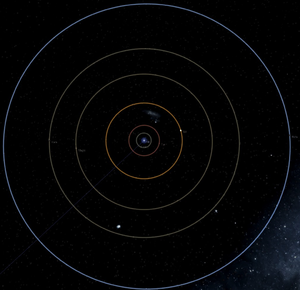 Playing on Polaris, this system is where you live and work; the NCS Northern Star and NLS Southern Cross are located here. Vir's government stabilized comparatively recently, and as a result has a smaller population than most other garden worlds. Its position along the Almach Stream and centralized between the Core Worlds, the Sagittarius Heights, and the Golden Crescent make it a veritable trade hub, attracting the interest of a number of Trans-Stellar Corporations, most prominently Nanotrasen. While considered a fairly "safe" system, its immense volume of trade attracts a number of pirates, and it sits uncomfortably close to the border with the Almach Association. 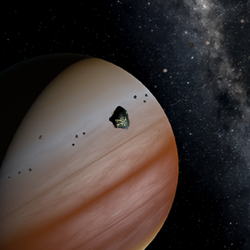 Vir was first identified as a candidate for colonization following a 2160 automated survey. Considered unreasonably far from Sol to sustain a colonization effort, the system would remain fallow for decades. Early in 2200, the government of the Scandinavian Union proposed a Sivian colonization project, in an effort to address overcrowding after the repair of Earth's ice caps. 2209 saw the formation of New Reykjavik from 10000 colonists aboard the SCV Leif Eriksson, soon followed by two more waves of colonists. While initially an extremely promising colony, a number of setbacks soon conspired against the Sivians. Piracy along the route to Vir cut deeply into the pockets of the small Earth nation that financed the colony. Distance from the Core Worlds allowed corruption to fester within the colonial administration, who syphoned luxuries and medical supplies from supply drops to gratify themselves. The colonists, most of whom had never set foot outside a city before, were unprepared to face the harsh Sivian winters or the planet's dangerous wildlife (soon supplemented by the Sivian Giant Spider). While colonies around Vir received economic and military support from the early Trans-Stellars, Vir itself was something of a "dead zone" for TSC investment as a result of being owned by an Earth nation. 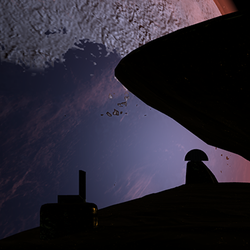 The outer belt and the moons of Kara became home to pirate bases while resupply runs from Earth became rarer. In 2292, Scandinavia finally withdrew from the system. The newly independent Sivian population had, over the course of many long winters, become insular and clannish and failed to form a single planetary government. The various Sivian communities were incorporated as individual protectorates in what they called the "silent collapse" of the Scandinavian hegemony. True industrialization would only be reached four decades later, when SolGov assumed administrative control over the system over the protests of its residents. Nominally an attempt to make trade in the region safer in light of the discovery of the Skrell, the Fleet occupation and the construction of the Vir Interstellar Spaceport saw massive improvements in Sivian infrastructure. The efforts of the Sol Marine Construction Corp to modernize the undeveloped nation, notably through the construction of the Radiance Energy Chain, were televised nationally, and caused an appreciable spike in Sivian immigration. Meanwhile, corporations began moving into the abandoned asteroid bases of the defeated pirates, discovering sizeable deposits of xenoarcheological artefacts and phoron. Vir came to develop two cultures; the Sivians, stoic, hardworking, and traditional; and the Karans, who were laid-back and cosmopolitan. The Karan development saw the first introduction of positronic brains to the Vir system. With the presence of a clear competitor and challenge to their way of life, the Sivians formed the Sif Planetary Government, or SifGov, in 2364. Capitalizing both on the anti-corporate sentiment of the galaxy and the growing belief in positronic self-determination, SifGov engaged in a series of limited wars with the corporations of Kara. The goal of the so-called Karan Wars was to establish SifGov as the sole authority in the Vir system, with the side goal of establishing democracy and positronic suffrage in the Kara subsystem. The Karan Wars continued on and off until 2412, when SolGov threatened sanctions, and resulted in a Sif Planetary Government that controlled far more than the planet of Sif. In light of this fact, and of the growing sense of a Sivian national identity, the Sif Planetary Government was restructured from a loose confederation to a unitary state, which controls the system today as the Vir Government Authority, or VGA. The new government quickly applied for and received full member state status, ending its 200 year tenure as a protectorate. The VGA brought an end to the fighting that had characterized Sif's society for centuries, but its anti-corporate policies lost it support from the TSCs and forced it into a long period of semi-isolationism. Virite politicians were an influential voice in the formation of the Shadow Coalition because of the system's history as a FTU stronghold. Vir's fortunes would only change with the beginning of the First Contact War, almost ninety years later, which resulted in a shortage of secure frontier colonies for corporate investment. VGA responded by reducing its protective tariffs and allowing TSC habitats in Kara significant autonomy, giving birth to the "marriage of convenience" between VGA and the phoron-hungry NanoTrasen in 2514. Vir continued to obstruct attempts by Nanotrasen and other corporations from constructing "voter farms" within the Vir system, ensuring that VGA would remain an unbiased democracy and maintaining their relationship with the Shadow Coalition upper staff. While today Vir has largely shaken its unsteady early roots, elements of its legacy remain. Sif is one of only a few garden worlds to contain only one state, and has a population to match. The Virite population is widely distributed through the countryside, with as many as 20% of the population living in individual homesteads. Outside of New Reykjavik, Kalmar, and other large cities, police presence remains negligible, giving Sif a reputation as a place to "lay low" or "go off the grid". Sivian natives still tend to be very self-reliant and somewhat distrusting of outsiders, corporations, and government, though this has lessened as migrants from outside Vir and from the cosmopolitan Kara habitats have begun to settle on the planet. Meanwhile, Nanotrasen continues to expand its phoron mines and research labs both on Sif and in Kara, injecting its futurist corporate culture and SEO influence into the system despite popular outcry. While sometimes stereotyped as sleepy and innocuous, beneath the surface is a tremendous amount of tension between the traditions of the past and the promises of the future-- giving the people of Vir an unusually personal perspective on the great questions of the era. 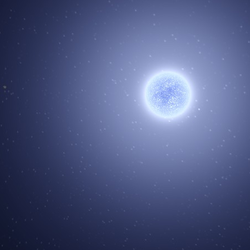 Vir is an A-type main sequence star with just over 80% more mass than Sol, and almost nine times as bright. 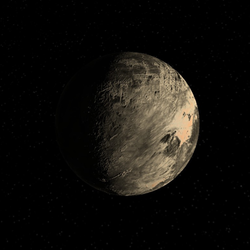 It has six major planets in its orbit. The Vir Interstellar Spaceport is a large facility in orbit of the planet Sif which handles the loading and unloading, refuelling, and general maintenance of large spacecraft. The position of the spaceport allows it to function not only as a key node for transport inside the Vir system, especially to and from the planet Sif, but also as a key stopping point interstellar craft travelling via Vir which need refuelling. The station itself is mostly designed around its logistical and commercial needs, and although other strategically-placed nearby facilities owned by a mixture of corporations and entities may possess habitation space, the port itself is not designed to be a living habitat - its proximity to the surface of Sif makes transport of people and materials to and from the facility and the planet via shuttle extremely cost-efficient. The main structure is owned by the Vir Governmental Authority, but individual offices, docking/loading bays, and warehouses are often leased to individuals or organisations. 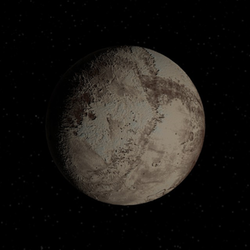 The closest planet to Vir. Tidally locked to Vir and having temperatures in excess of 570 degrees kelvin (299°C) on the day side has caused this planet to go mostly ignored by colonists. 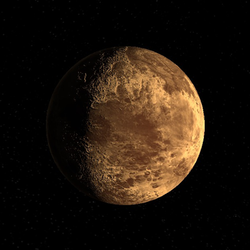 Second closest planet to Vir, with a high concentration of minerals in the crust, but otherwise a typical planet. The surface temperature can reach 405 degrees kelvin (132°C), which deter most mining operations. A corporation called TODO has a mining base and a few orbitals established, utilizing specialized equipment, chiefly being autonomous synthetic mining drones. 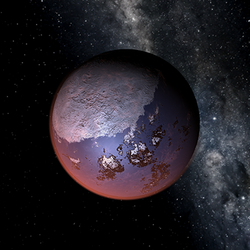 Outside of the habitable zone, Vir-e is generally at 202 kelvin (-71°C). A gas giant, with a large number of moons. Captured asteroids, to be specific. Many of the asteroids are theorized to be the remnants of a moon of almost Martian size that was ripped apart by Kara, long ago. By now, a large number of these asteroids are being used by many different businesses, and some governmental infrastructure has been built. The most prominent asteroid installation is the NCS Northern Star, a general purpose colony owned and operated by Nanotrasen. 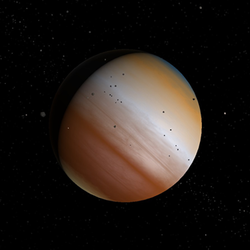 The mid-atmospheric temperature of the gas giant is 150 kelvin (-108°C). 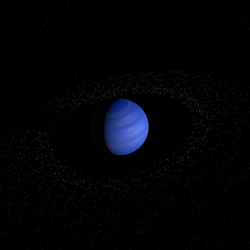 A Neptune-like ice giant, with a beautiful ring system circling it. It is 165 kelvin (-157°C). A sparse government-owned chain of automated stations exists between Firnir and the star itself. The idea is based on an ancient design that was pioneered at Sol. The stations are heavily shielded from the stellar radiation, and feature massive arrays of photo-voltaic panels. Each station harvests energy from Vir using the solar panels, and sends it to other areas of the system by beaming the energy to several relay stations farther away from the star, typically with a large laser. These stations are generally devoid of life, instead, they are operated mainly by Drones, with maintenance performed by positronic equipped units in shielded chassis, or very brave humans in voidsuits that protect from extreme heat, and radiation. There are currently 19 stations in operation. 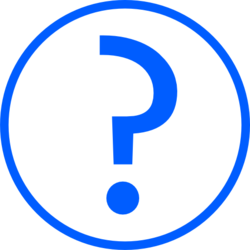 This page was last edited on 19 November 2018, at 06:17.